GIGABYTE Ultra Durable™ motherboards use high quality Nippon Chemicon ARE series audio capacitors. These professional audio capacitors deliver the highest quality sound resolution and sound expansion to create the most realistic sound effects for user experience. + Separation on the PCB layer protects the board's sensitive analog audio components. + Separate analog and digital ground to protect against Electromagnetic Interference (EMI). GIGABYTE Ultra Durable™ 4 Plus debuts on GIGABYTE motherboards, with a range of features and component choices that provide record-breaking performance, cool and efficient operation and extended motherboard lifespan. GIGABYTE uses All Solid Caps (Capacitors) and Low RDS(on) MOSFETs which are rated to work at higher temperatures to provide a longer lifespan. GIGABYTE motherboards feature GIGABYTE DualBIOS™, an exclusive technology from GIGABYTE that protects arguably one of your PC's most crucial components, the BIOS. GIGABYTE DualBIOS™ means that your motherboard has both a 'Main BIOS' and a 'Backup BIOS', making users protected from BIOS failure due to virus attack, hardware malfunction, improper OC settings or power failure during the update process. Humidity can play havoc on a motherboard's circuitry.GIGABYTE's new Glass Fabric PCB design helps protect against electrical shorts due to humidity by reducing the gaps in spacing between PCB filaments. GIGABYTE also uses Anti-Surge ICs to protect the motherboard against power surges. GIGABYTE motherboards feature High Resistance ICs which help protect the motherboard against electrostatic discharge. 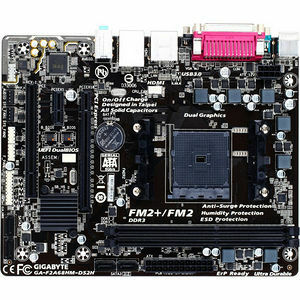 GIGABYTE FM2+ series motherboards feature AMD the latest FM2+ socket, and are designed to get the most from forthcoming AMD Kaveri APUs, while preserving compatibility for current AMD FM2 APUs. AMD FM2+ APUs offer native support for 8 GT/s PCI Express gen 3.0 as well as DX11.1 support integrating the high performance 'Steamroller' core. Based on AMD A68H chipset, native USB3.0 and SATA3 ports support up to 5Gbps and 6Gbps of data transfer speeds, delivering the GIGABYTE FM2+ series motherboards most stable and high efficiency working experience via the GIGABYTE Ultra Durable™ technologies. The AMD FM2+ series platform showcases AMD Dual Graphics technology, allowing users to further boost 3D graphics performance by adding an additional discrete AMD Radeon™ graphics card to the system. This unique Dual Graphics technology means users can enjoy higher frame rates on the latest gaming titles, utilizing the processing power of both discrete and integrated graphics processors.